First Line: It was a Thursday evening in March; the sky had given up its nightly fight against the dark a little later than the day before, but it still felt more like winter than spring. 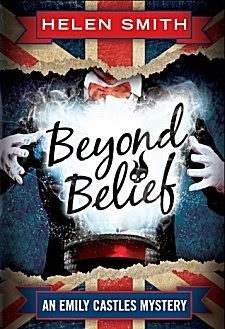 Bored with her London office job and strapped for cash-- as usual-- Emily Castles willingly jumps at the chance for an all-expenses-paid trip to the Belief and Beyond Conference being held in Torquay. She even has a job title: "future crimes investigator", given to her by Perspicacious Peg, a psychic who's a member of the Royal Society for the Exploration of Science and Culture-- the organization which is paying Emily's bills. The psychic has foreseen a murder being committed at the conference, and Emily is to investigate and, hopefully, prevent it. Emily meets a very colorful and eccentric cast of characters in the seaside resort town of Torquay: Madame Nova, a fortune teller who sells costumes on the side; Bobby Blue Suit and his three psychic dachshunds; a couple mourning their dead son; religious cult members; and celebrated magician Edmund Zenon, who's offering £50,000 to anyone who can prove that the paranormal exists. Since Zenon is the predicted murder victim, Emily has her work cut out for her amongst such a large list of possible suspects. For all the tweets and Twitter mentions of Gerald Ayode, president of the Royal Society for the Exploration of Science and Culture, this book actually feels as though it takes place in the 1930s and 1940s of the "Thin Man" movies starring Myrna Loy and William Powell. Beyond Belief moves along at a leisurely pace, and its humor is gentle-- those aforementioned tweets are one of the best parts of the book. Smith excels in creating setting, atmosphere, and a dazzling array of characters, but the book lacks cohesion. This is the fourth book in the Emily Castles series, and the first that I've read. From the beginning I felt as though I was missing some important background on the main characters, and this feeling never went away. Although the cast is marvelous, several of the characters' motivations were never clear. The tone of the book jerks back and forth between Smith's wacky, gentle humor to a more sinister note. If anything, I felt that this story needed about fifty more pages to add more detail and to smooth out rough spots. There's much to appreciate in Beyond Belief: the author's ability to set a scene, her talent for characterization, her use of humor; but in the end the story itself isn't quite up to the task. Cathy - This does sound like an interesting premise for a story. Sorry to hear that it didn't quite live up to what you'd hoped. Still, I do like a solid sense of atmosphere in a novel. I wonder if you'd have had a different experience if you'd already read the earlier novels. Perhaps not. I wondered about the exact same thing, Margot.